Milford, NH, June 3, 2009 – Earthworks, manufacturer of High Definition Microphones™, announced the introduction of its DP25/C and DP30/C tom and snare microphones, which are now shipping to retail outlets and sound contractors on a worldwide basis. The DP25/C and DP30/C make their debut following the highly successful launch of the FlexWand™ High Definition Microphone™ and the award winning PianoMic™ System. The Earthworks DrumKit™ Systems have had great success because they pick up drum sounds with far more detail and accuracy than conventional microphones. This improved sound quality is due to proprietary advanced technologies utilized in Earthworks High Definition Microphones. The DP25/C and the DP30/C are able to capture an exceptional degree of detail due to their extended frequency response and fast impulse response. The diaphragms found on the DP25/C and DP30/C settle much more quickly than competing microphone diaphragms, enabling them to more accurately capture the widely varying timbre and dynamic sounds typically found in a drum performance. 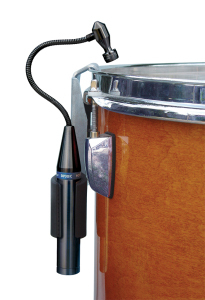 The DP25/C, designed specifically for snare drums, has a frequency response of 50Hz to 25kHz while the DP30/C, designed for toms, has a frequency response of 30Hz to 30kHz. Both microphones have a flexible mini-gooseneck and can handle up to 145 dB SPL. Their polar patterns feature excellent rear rejection, helping engineers control unwanted bleed and feedback. The new Drum Periscope™ tom and snare microphones perform exceptionally well for both live sound reinforcement and recording applications. Dream Theatre is among the first international recording artists to put the new Drum Periscope microphones into regular use on the road, and has been touring with them for over a year.